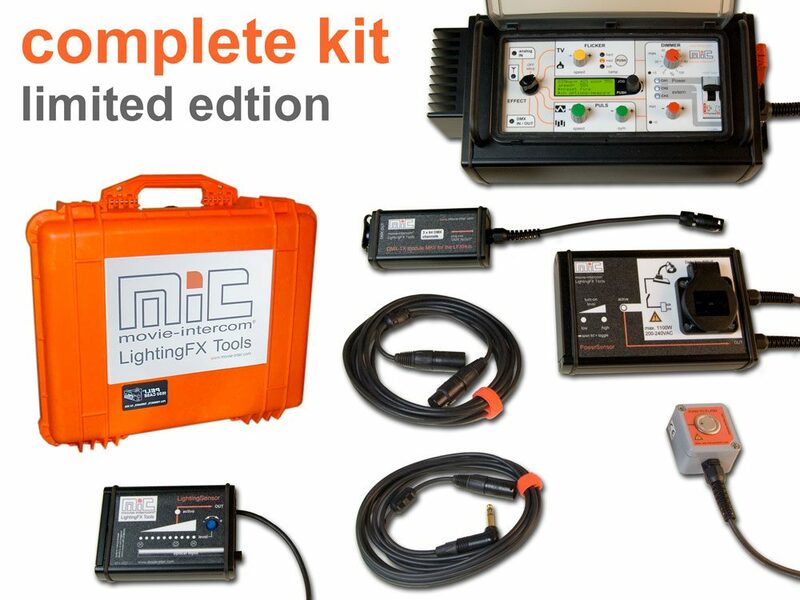 It´s available in a kit – while stock last. Create natural looking lighting effects using HD flicker curves and 3 channels. 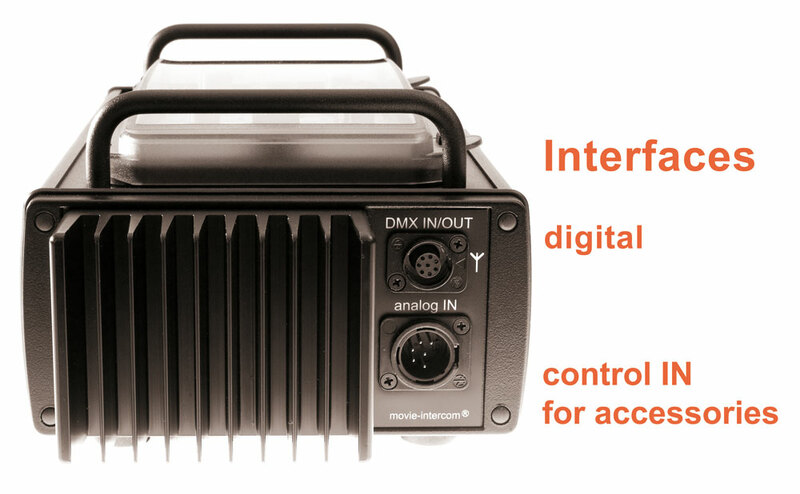 The input for accessories allows for talent controlled lighting, SFX & lightningFX. Control any number and size of tungsten, LED, fluoros and even HMIs combined with dimmer-shutters. 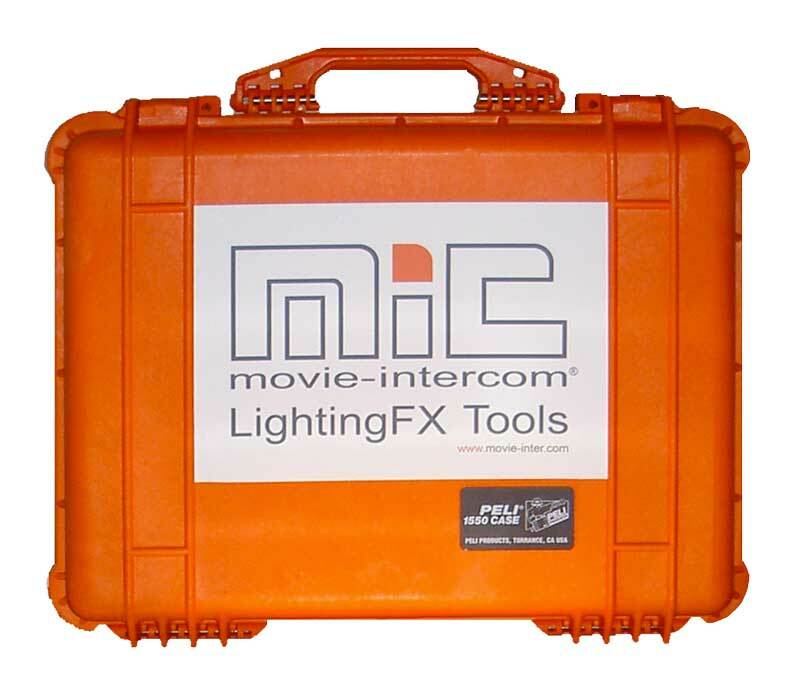 Its high quality lighting effects is proven since more than 20 years. 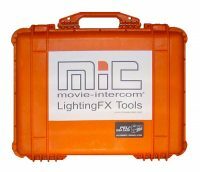 The numerous options for variations of all effects makes the LFXHub to the universal tool for lighting effects. 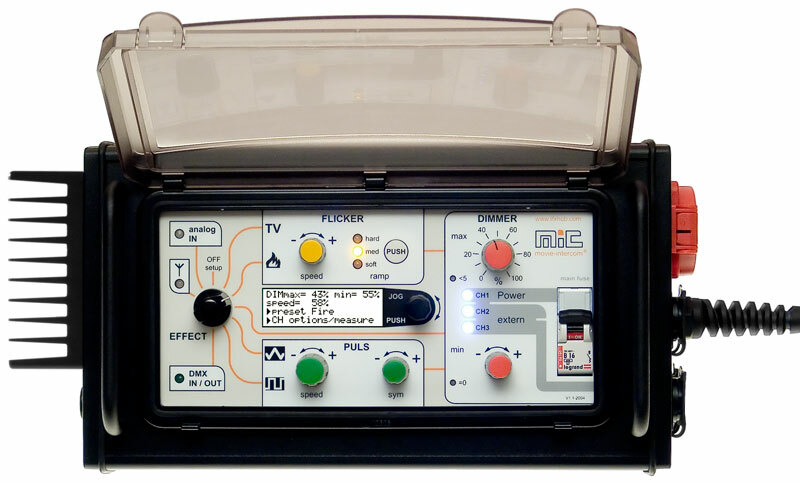 With the wide range of available accessories this flicker box can be extended to an interactive lighting control unit. Let the talents control lighting! Additionally the “Ramp” -function shapes the signal from smooth to hard, suitable to the type of lamp and power you prefer to use – LED or tungsten from 25 W to 10 kW. Original flames of a fireplace “dance” around. 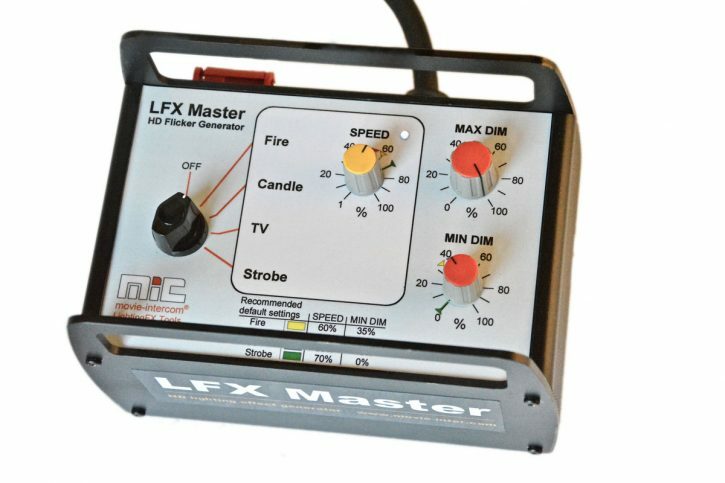 The 3 channel “fire” preset of the LFXHub automatically alternates the dim level of each channel the way a real flame would behave – flickering shadows. For TV effects with three channels even the color changes in RGB mode when three different lamps are used. Choose the easy way to get a high power flickering fire light. Let it burn with one or multiple dino lights! 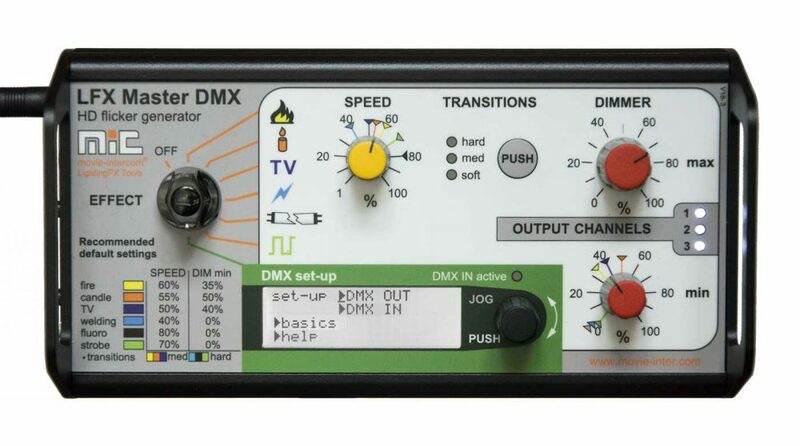 You may use a DMX-512 based 3 x 5k dimmer hooked up at the DMX-output module of the LFXHub flicker generator. 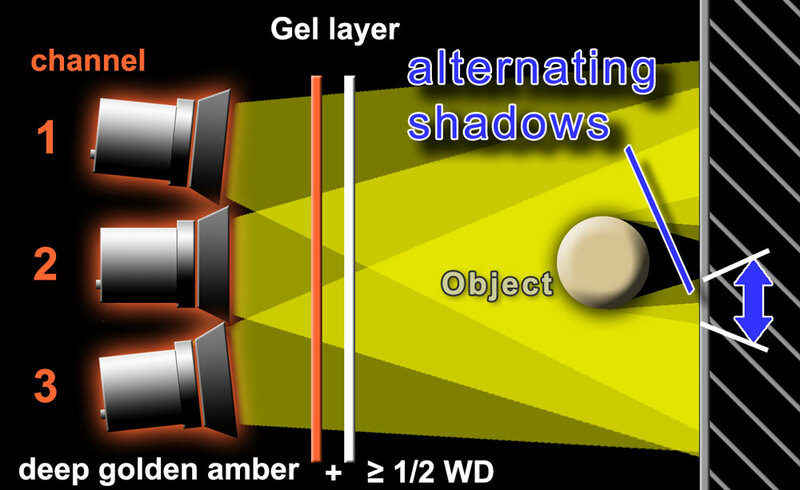 As shown to the left three lamps – separately controlled by the LFXHub – will initiate three different cast shadows of an object on a surface (here is simply a wall). The gel “deep golden amber” is used to get the right color temperature, the attached 1/2 white diffusion softens the cast shadows of the three lamps, the effect looks natural. Alternatively use CTS and other colored gels. If you remove the object you will not see any flickering shadows. Besides the adaptation to the filament inertia the “Ramp” feature of the LFXHub modifies the transitions between the channels (hard, medium, smooth). The distance between the gels to the lamps should be at least 30 cm (1 ft) the size of surface of the white diffusion gel should correspond to the original (or pretended) size of the fire source. 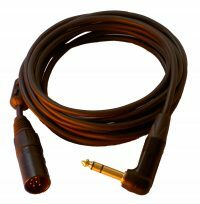 Instead of using three halogen lamps you could use e.g. a Parabeam 400 or some household type bulbs attached in a geled box. 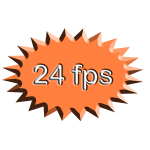 If there are no objects in front of the background a single channel effect is sufficient. 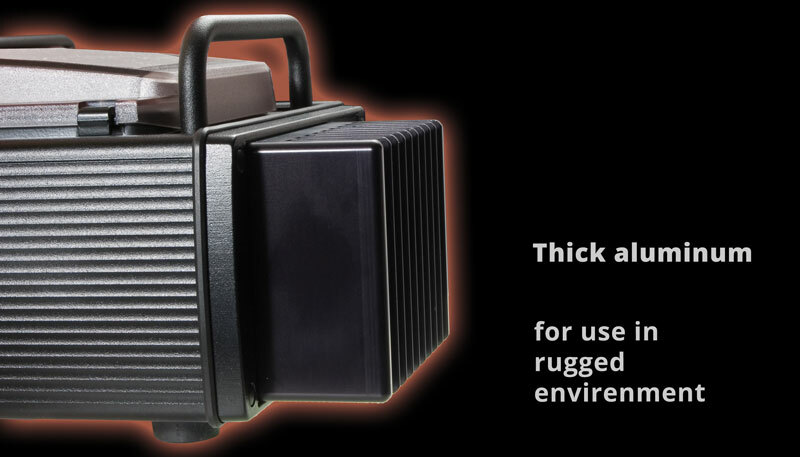 Use different effect gels on the three lamps – the color temperature would change either. If the object is too far away from the background you will not see flickering shadows, normaly a distance of around 60 cm (2 ft) is ideal. Use every type and size of tungsten lamps or LED. 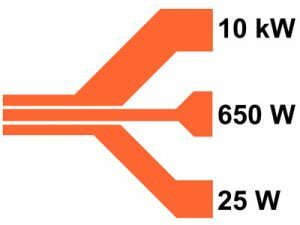 A result of an effect would look different with the same signal used at different lamp types/sizes, particularly if an LED lamp is used. 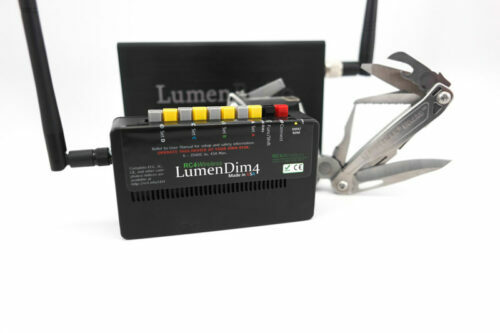 “Ramp” adapts effects to the duration of persistence of various types of filaments or to LED lamps. The timing difference between the moment of electrical deactivation and the time of a completely extinguished light depends on the power of the bulb. Choose the transition mode depending on the connected type and size of lamp (bulb inertia). Thus any lighting effect looks excellent – with a 10K, a redhead, a standard 60 W bulb, fluoros or LED. Use “Ramp” for different styles of e.g. fire – from aggressive to smooth. 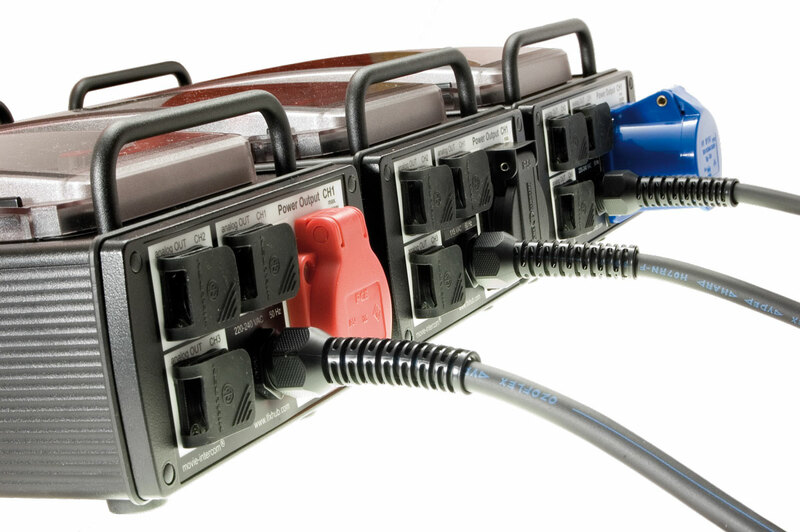 Different interfaces of the LFXHub makes it easy to drive virtually any lamp fitting your needs. Smart interfaces simplify even normally time consuming set-up of lighting effects. 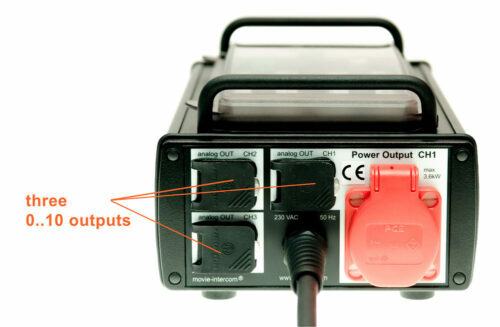 The maximum output power only depends on the number and maximum output power of the connected dimmer or led fixtures. Create a fire effect with flickering shadows or a sequencer for neon sign effects on the fly. This is an upgrade option for the LFXHub. 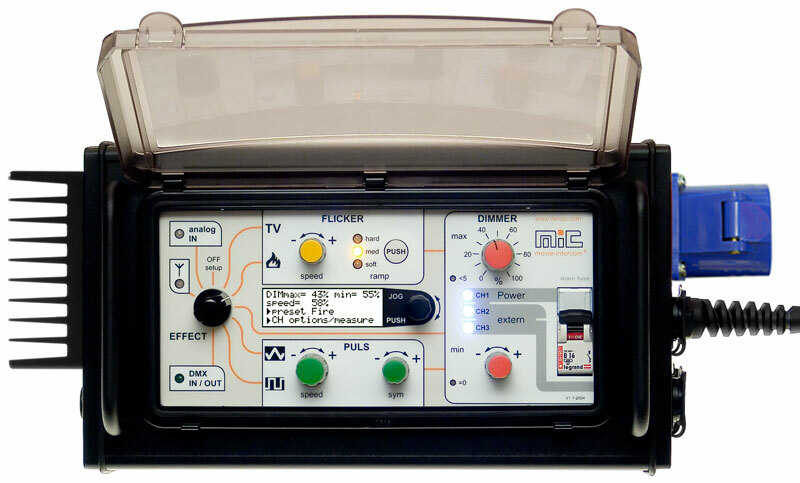 The “lightningFX” upgrade consists of the trigger module and a software upgrade with three additional presets: lightningX, single -flash and multi-flash. 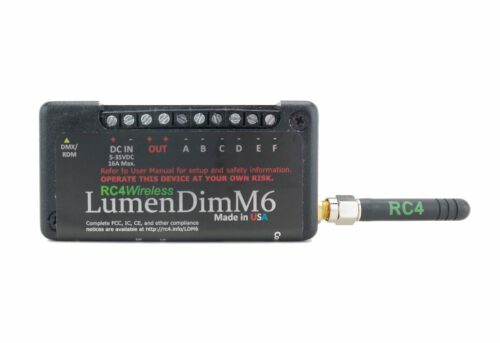 Create stunning lightning and flash effects controlling one or more dimmer-shutter(s) using HMIs up to 18 kW or any number of LED lamps. 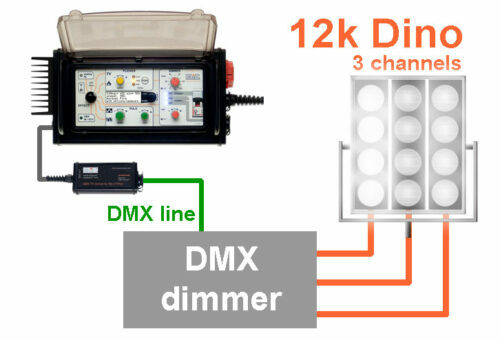 Link the shutters via DMX with the LFXHub. 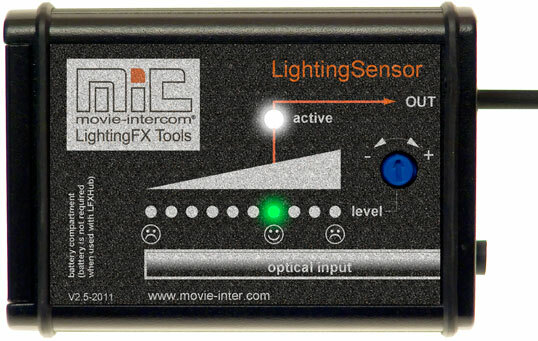 The HMI is steadily on, the dimmer-shutter controls the brightness. Create breathtaking “moving” thunderstorm flashes using three channels.